Θέμα: 32 πεζοπορικές διαδρομές στο νησί της Σάμου. Άλλα στοιχεία: Κάθε διαδρομή συνοδεύεται από χάρτη. Εισαγωγή με γενικές πληροφορίες για το νησί της Σάμου. Διαστάσεις: Υ 20 Χ Π 12 εκ. 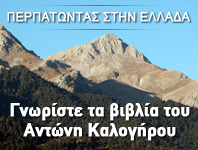 «Samos island is a hikers's paradise! Hundreds of kilometres of forest trails and cobbled paths crossing through a beautiful countryside link many of the most interesting places of the island: traditional villages and monasteries, mountain tops and impressive ridges, remote beaches and ancient ruins. Lush landscapes and amazing ocean views alternate for a most rewarding experience. 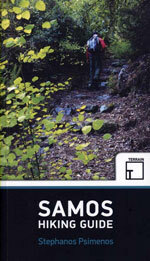 Through 32 well-designed hikes for both the casual stroller and the adventurous hiker, this hiking guide book aims tο help you discover the most authentic face of Samos island».